The policy with regard to visiting the home is ‘open house’ and visitors are welcome at any time. However, it would be appreciated if visiting at mealtimes and after 9pm could be avoided when possible (unless prior arrangements are made), to allow night staff to secure the building. Meal times have been detailed previously. If a visitor is travelling a distance or visiting for long periods, they are welcome to join us for a meal. 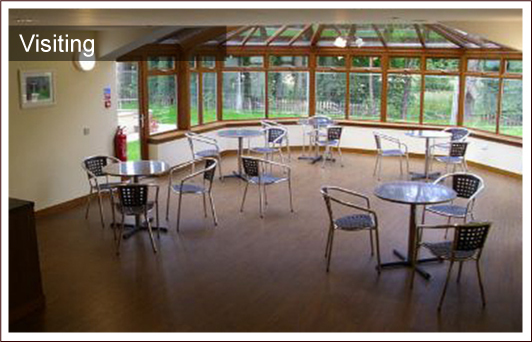 Tea, coffee and soft drinks are always freely available for visitors and residents. Staff will always ensure that residents are informed of any appointments they may have to prevent any overlap or disruption to visiting. All visitors must inform a staff member of their arrival. The visitor must confirm who they are and whom they are visiting. The visitor’s book must be signed so that if there is a fire, there is a record of who is in the Home.